There are two ways to read Inventing the Future. One is a fairly innocent critique of the “post-68 left”, and an outline of how to build a desirable post-capitalist future through a flawed Gramscian framework. The other is a critique of working class self-activity, and a call for a benevolent class of technocrats who can gradually reform capitalism for the masses. Upon release the book was praised by prominent leftist personalities, including Paul Mason, Mark Fisher and Owen Jones. The authors were featured on the Novara Media podcasts, gave talks at universities and more recently spoke at a number of Labour Party events. In 2016 Srnicek went on to release another book, Platform Capitalism, a look at modern capitalist firms such as Google and Facebook, while Williams has a forthcoming book in the works on hegemony and the left. More importantly however, both got swept up in the movement around Jeremy Corbyn, and seem to have joined the ranks of the Labour left in the process. And although we are late to the party with the following review, it is the political trajectory of the authors of the book, revealed over the past three years, which illuminates the problems at the core of Inventing the Future. Rather than to a defined political tendency, Inventing the Future speaks to the broad church of “the left”. It provides a “critique of today’s left”, and sees the need for a “counter-hegemonic movement” which can “rebuild the left”. But who is “the left”? Where are the lines drawn? This is something that the authors never really define. If accelerationism suffers from a “miasma of competing understandings”, then “the left” is an even more ambiguous term. Inventing the Future posits an abstract left (anti-capitalism), against an abstract right (capitalism). Both political options are then divided into two categories – both the left and the right have a folk political current, and a universalist current. The authors go on to critique the folk political left and argue for a universalist left instead. But the left is of course not easily demarcated and does not strive towards a common goal as the authors assume. There are a number of other problematic assumptions that the authors make right off the bat. The first is that social democracy is "impossible", “outdated”, a thing of the past. The second is the definition of folk politics itself. Lack of a serious critique of social democracy, and the role that it may still play in the capitalism of today, leaves “the left” open to being drawn back into its clutches once it appears in a seemingly new or unexpected form. The Corbyn phenomenon provided exactly such an opportunity, to the point where even some supposed anarchists have now joined the Labour Party ranks.5 Inventing the Future was written just before the rise of Corbyn, but in 2015 social democracy was already a visible force strong enough so that it could once again lead masses of people into electoral and reformist dead ends (e.g. Syriza, Podemos). While a section of the left does indeed embrace a form of folk politics that Srnicek and Williams go on to criticise, the social democratic illusions of the left never went away. For anyone aware of the state of working class politics in Britain this should be obvious – the myth of 45, the trade unionist, Trotskyist and Stalinist hopes for the return of a "real" social democratic party, whether that be the Labour Party, or failed projects like TUSC or Respect, are many. Great swathes of the British left have always aligned with social democracy rather than any “horizontalist” alternatives. The Labour Party currently has over half a million members, and as Srnicek admitted during the general election of 2017: “In the end, Labour has presented a vision of a better world and the massive rallies attest to the power such a vision can mobilise […] we need to build on the momentum achieved in the campaign.”6 And so it seems the accelerationists have been outpaced by old-school social democrats! Apart from confusing left communism with the communisateurs of Tiqqun and the Invisible Committee, the authors group together a very broad and disparate spectrum of contradictory tendencies – basically anything and everything which engages in prefigurative politics or direct action and could be in one way or another lumped under the broad church of “the left”. Whatever the limitations of, say, anarcho-communism, it represents a legitimate revolutionary current with an orientation towards the working class, as opposed to something like the fair trade movement or the Green Party. For the authors though it is all about form and not content. Despite being a very broad category, the critique of folk politics is not off the mark. Direct action and local community resistance is, as the authors say, insufficient on its own. As the communist left has always argued, spontaneous class struggle alone will not end capitalism. Strikes, occupations and protests can build confidence, provide experience, and win concessions from employers and landlords. But the working class needs its own organs to centralise its struggles across a vast territory, a function played in the past by workers’ councils and assemblies. And it also needs an international and internationalist party to provide a long term political vision and consciously guide the struggle in a communist direction. Without such a global organisation every rebellion will be condemned to burn itself out inside the system. The authors recognise the insufficiency of defensive struggle, but the solution they come up with instead is a “Mont Pelerin of the left”. While the Accelerate Manifesto calls Marx “the paradigmatic accelerationist thinker”, it is important to remember that for Srnicek and Williams the working class is no longer the revolutionary subject. With their call for a Mont Pelerin of the left – the agent of change becomes the technocrats and the petty-bourgeoisie who can successfully, step by step, influence state policy and provide the slogans for movements of the global surplus population. The orientation towards the Labour Party, new media, and leftist think tanks, is only a logical continuation of this line of thinking. The central thesis of chapters four onward is what a leftist project that is universal and able to present an attractive vision of the future might look like. All the while the authors remind us that a folk politic, pre-occupied with defending localities, is not capable of doing this. But what is it that they actually propose? Behind all the accelerationist and futurist rhetoric lies what amounts to a number of fairly mundane transitional demands: universal basic income (UBI)10, automation and the reduction of the working week. Automation is marching onward regardless (whether it is reducing the number of jobs or producing killer drones), while basic income pilots have already been initiated in multiple countries, from Namibia to Finland. All of this without the need for any accelerationist left to “demand” it. What that left can now do, according to the authors, is to accelerate these processes and influence the way they are implemented. For them these are non-reformist reforms which “will not break us out of capitalism, but they do promise to break us out of neoliberalism, and to establish an equilibrium of political, economic and social forces.”11 In terms of tactics, Srnicek and Williams’ vision is allegedly a long term one. The rise of neo-liberalism took 40 years or more. Likewise the British left will need to over time build its own hegemony. This has to include politicians, business experts, new media, and academics – with Corbyn, McDonnell, Piketty, Stiglitz, media outlets like Novara or The Canary, Paul Mason and Owen Jones, and indeed the authors themselves, first steps towards this have been made. That is not to say that in their vision there is no place for the “grass-roots”. On the question of organisation, the authors propose a revamped popular front, simply arguing that different organisations are needed for different things, and that it’s no good fetishising one particular form of organisation over another. However this is a situation which arises spontaneously in any social movement – to take the example of Occupy, it was not just horizontalist affinity groups that were involved, but also all manner of political parties, media groups, trade unions, etc. There was no healthy ecosystem as the authors would have liked to see, but it wasn’t because of lack of will, rather because all these organisations correspond to different aims and material interests. Forms of organisation are not neutral, just like the state is not neutral. This is something which the capitalist left seems to struggle to get to grips with. Affinity groups, trade unions, institutional parties and the state cannot all be just repurposed to achieve any goal desired (in this a case a post-work future). This becomes even clearer in the examples of this “ecology of organisations” provided by the authors – Venezuela and Podemos. If the so-called Venezuelan communes (which at best function as a form of participatory budgeting, at worst as the local enforcers of the PSUV government), or the crowdfunding platforms of Podemos (designed to raise funds for its electoral campaigns), are the best examples of a healthy “counter-hegemonic ecosystem” then the future looks pretty bleak indeed. In its lack of a materialist understanding of organisation and the state, the authors, in the tradition of Gramsci, find themselves squarely on the side of idealism. It is no surprise then that Inventing the Future puts the cart before the horse: it wants to get rid of wage labour by creating a new populist metanarrative and infiltrating left wing parties – without the working class ever taking power, and without the abolition of capitalist social relations. Inventing the Future has already made an impact on the Labour left. 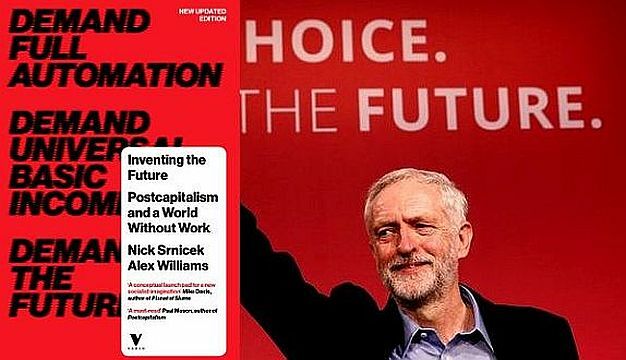 In 2015 Srnicek and Williams were sending copies of the book to the new Labour shadow cabinet in the hopes that it would help the Labour Party address “the most pressing issues of the 21st Century”.12 By 2016 the book was popular enough in Labour circles that Srnicek was invited by John McDonnell to give a talk on “Technology and the future world of work” during a series of public events on “New Economics” convened by the Labour Party.13 In 2017 Inventing the Future got a mention in a report commissioned by John McDonnell and Rebecca Long-Bailey.14 That same year Srnicek also gave a talk at the Labour conference fringe event, The World Transformed. This convergence is not incidental. There are two ways to read Inventing the Future. One is a fairly innocent critique of the “post-68 left”, and an outline of how to build a desirable post-capitalist future through a flawed Gramscian framework.15 The other is a critique of working class self-activity, and a call for a benevolent class of technocrats who can gradually reform capitalism for the masses. The book is written in a way that makes it seem like the two interpretations are not mutually exclusive, which might be part of the reason behind its appeal (name dropped in the New Statesman and the Guardian, three years after release it still easily available in high street bookshops). This mixture of Gramscian terminology and accelerationist imagery does have some appeal among the university educated left, and combined with the willingness of figures such as McDonnell to engage with economic ideas deemed “cutting-edge” or “radical” by the mainstream press, it does give Corbyn’s shadow cabinet a facade of modernity – whether anyone in the upper echelons of the party actually take it seriously or not, it helps to counter the propaganda of the Conservative right that a Labour government “would take the country back to the 1970s”. So is post-capitalism just a programme for post-neoliberal capitalist restoration? If the political trajectory of Srnicek, Williams, Mason, and the Corbynist Labour manifesto is anything to go by, then yes. The aim here is to get rid of neo-liberalism first and reconstitute capitalism on a “healthier” basis. The final dismantling of the class system is simply relegated to a distant future. Folk politics may be “insufficient”, but think tanks and leftist advisors to bourgeois states are no solution either. The perspectives of the communist left remain with the working class, and not “the left” (of capital). 15. For more on Gramsci see leftcom.org. The translation of Onorato Damen’s book on Gramsci will appear later this year.